Cut the top off your Trabbi and you’ve got yourself a wild ride! Yes, when you think of Communist cars, you don’t think of the Lada Riva or the Wartburg or that weird Chinese Austin Maestro/Montego hybrid, you think of the Trabbi! Built in East Germany, the Trabant started production in 1957 and continued right through until the end of the Eastern Bloc in 1991! And in that entire time the car went through pretty much no modifications from its original design. This car pictured is in fact a 1988 Universal model, which looks exactly the same as a 1958 Universal! 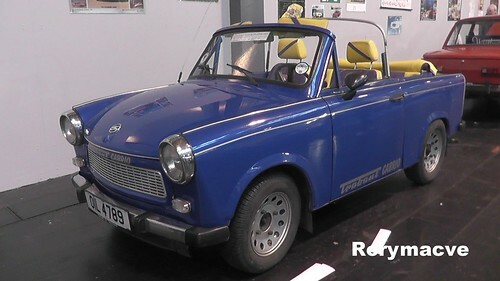 The car has the distinction however of being the first car built out of recycled materials, although today many eco-cars can claim they were constructed from several fridges or tin cans, the Trabant was the one that perfected it. But these recycled materials were not tin cans or fridges, or any other rigid metallic materials, but was in fact recycled cotton! Cotton waste from the Soviet Union and East German dye industry was compacted into a material known as Duroplast (hard plastic), and this is what the body was made of. Although at the time this was claimed to be stronger in crashes than any Western cars of comparative size and shape, I have a strong suspicion that these tests were carried out at 3mph against a mattress! The car was powered by a 600cc two-stroke engine for the first 30 years of its life, although for the last 4 it was powered by a Volkswagen 1.6L engine from the Polo. In total, the best part of 3.7 million Trabants were built and plied their trade along the roads of the Eastern Bloc until the fall of the Berlin Wall in 1989, when thousands of these cars and their owners made their way into West Germany and dispersed across Europe. Although many were abandoned within days of the crossing, the Trabbi has since become probably the most famous cult car of all time, with many Westerners picking them up in 1990 for a single Deutsche Mark. So why would people want to buy a car that’s as slow as sin, as reliable as lighting a match in a Force 10 Gale, has the crash safety of a paper bag and the prospect of the wheels falling off at any given moment? Novelty of course! I’ve met many Trabant collectors at car shows, and their answers have consistently been for the novelty. Be it because the car was made by a Communist regime that no longer exists, the time-capsule styling of the 1950’s on a 1990’s car, the fact that it is so unreliable and unsafe that it inspires a sense of danger and risk, or mostly because it’s something of a cultural symbol that is easily personable. Today you’ll find that a lot of Trabant’s aren’t exactly in an original guise like the one here, most have been converted into caravans, racing cars, rally cars, mock military vehicles, police cars and even stretched limousines! Whilst those that don’t remain on the road usually find themselves in a variety of exhibits, such as in the Dublin Hard Rock Cafe, there’s a Trabant hanging upside down from the ceiling! And at the Rock n’ Roll Hall of Fame there’s several flying Trabants suspended from the roof! But in any case, despite the various flaws in its Communist construction, the Trabbi has certainly found its way into the hearts and minds of many a lot more that other Eastern cars of the time. Previous Previous post: Driverless Cars – How About Autonomous Garbage Trucks, Mail Keeps, and Military Convoys First?